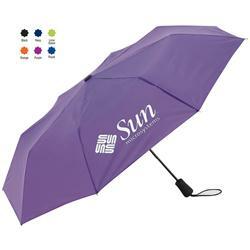 Custom mini folding umbrella with your logo. Automatic opening mini nylon umbrella with 42" arc, black shaft and ribs, black rubber handle with bungee wrist strap and matching nylon sleeve. 12" when closed. Available Colors: Black, Navy, Lime Green, Orange, Purple and Royal Blue. 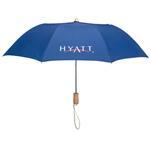 Rubber Handle, Auto Open, Folding Custom Mini Umbrella. Carton size: 12.44" x 9.44" x 19.68"